Today is December 31, 2012 and we’re about to start a new year. It’s a moment for reflection on what has happened over the last year – triumphs, disappointments, changes, new experiences, and what one aspires for in the new year. After a four year hiatus, I’m relaunching this blog because I want to write more and share more of my life. I suspect that by writing about my experiences, it will not only be easier to remember them, but they will feed into a bigger story. Read my blog post about how I got over my hangups and resurrected this blog. What has happened in the last four years? This blog post would go on forever if I attempted to summarize everything, so I’ll just give you the highlights. Without further ado, here is my retrospective for 2012. I stepped back from my duties as president at Jazkarta, my web development company, to focus more time on Appsember, my new startup company. Appsembler’s mission is to make it easier to find, try and buy open source software. Last fall, my co-founder announced that he was leaving the company (which was called DjangoZoom at the time). We parted ways amicably and after much deliberation I decided to continue but in a new direction that eventually became Appsembler. That same fall I applied to Techstars Cloud, a new startup accelerator program in San Antonio modeled after the existing Techstars programs in Boston, New York and Seattle. The program ended with “demo day” (see this article in Gigaom) where I stood up on stage and gave a memorized 5 minute pitch in front of a hundred or so investors. Talk about nerve-wracking! I feel extremely fortunate to have had this experience. (Supposedly it’s harder to get into Techstars than it is to get into Harvard.) I would do things differently if I had the opportunity to do it again, but I don’t regret anything that I experienced. Sometimes learning lessons the hard way is the best way to ensure that you don’t repeat your mistakes. When I returned to Massachusetts, I applied and got into MassChallenge, another startup accelerator in Boston. It’s the largest accelerator in the world with over 100 companies participating so the experience was quite different than Techstars. Through this program I was connected with a bunch of great mentors who now serve on the company’s advisory board. I don’t know what Chapter 4 of this entrepreneurial journey will look like, but it’s showing signs of venturing into the burgeoning educational technology (EdTech) space. More on that later! In the fall of 2011, I was suffering from flu-like symptoms and severe joint pain, and my doctor diagnosed me with mono. While visiting my dad in San Francisco and eating a taco, I suddenly experienced paralysis of the left side of my face. My dad rushed me to the emergency room where the doctor on call diagnosed me with Bell’s Palsy. With this new condition, I went back to my doctor in Boston and after two tests, he diagnosed me with Lyme disease. Two weeks of antibiotics treatment, and all the symptoms (including the paralysis – thank God) went away. In 2012, I experienced severe pain in my bottom molar tooth. After seeing three dentists, and getting a partial root canal, the tooth had to be removed. Upon inspection of the tooth, it was obvious that the infection was caused by hairline crack – a crack that was most certainly caused by the impact of the bike accident two years earlier! These three incidents spanning over 3 years was a reminder that health is not guaranteed. Life is a precious gift, and you don’t know how fragile you are until your health is taken away from you. Losing one’s memory and waking up in an emergency room is a scary thing. Losing the ability to smile or eat your breakfast cereal without drooling is a scary thing. Losing the ability to eat solid foods is a scary thing. I vowed to take better care of myself, eat more healthy foods, always wear a bike helmet, and stay away from ticks! Footnote: I never found the signature bullseye ring that usually accompanies a tick bite. Had I found it earlier, I could have avoided a lot of pain, anxiety and hospital bills. Words of advice: if you go hiking, inspect yourself afterwards, or better yet, have someone else inspect your body, because those ticks can hide out in some unusual places! As many of you know, I love to travel. As the cost of fuel has gone up, and my available time while trying to run two companies has gone down, my travels have not been as frenetic as in past years. 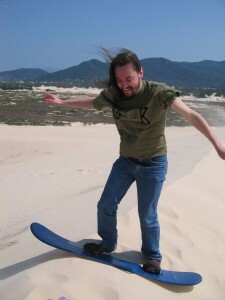 Most of my trips have been domestic, but in summer 2010 I visited Brazil a second time to give a keynote at FISL. This was the last time I saw my dear friend Dorneles Tremea before he was killed in a tragic car accident. See my photo memorial and video that I took of him. Later that year I visited Bristol, UK for the first time to attend the Plone Conference. I hardly remember the last half of this trip because I was sick in bed – little did I know at the time that it was the beginning of the Lyme disease symptoms. Both of these trips merit their own blog posts, but for now you’ll have to settle for the Flickr photo sets (Brazil photos, Bristol photos). Last year I did a month-long trip to Europe where I co-presented at two conferences (DjangoCon in Amsterdam and EuroPython in Florence). By way of speedy European trains, I rode the rails from Holland to Italy, and stopped along the way to visit my long-time friends Nils in Germany and Andrew in Strasbourg. The moment you’ve all been waiting for! It wasn’t only fuel costs that have kept me mostly Stateside the last two years. 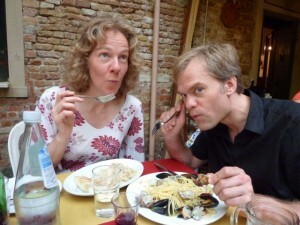 In early 2011, I started dating Anna who I had already known as a friend for years. Not only do we share a common interest in music making, but like me she’s also a software developer, having previously worked as an iOS developer. In fact, my co-presenter at DjangoCon and EuroPython on the talk “iPhone-Python love affair: Building APIs for mobile” was Anna! And to top it off, Anna is also an entrepreneur! She is currently running her own startup ZoomTilt whose mission is to help filmmakers get paid for their creative work. We make a great team and I couldn’t have asked for someone better suited to be my lifelong lover and friend. After living in my Back Bay bachelor pad since 2005, I made another big change, and this fall moved into the Herbert Simpson Coop in Davis Square, that Anna started a few years ago. I had been wanting to move to Somerville (and specifically Davis Sq) for a long time, since most of my friends lived in the area. I had even gone so far as to get a pre-mortgage to buy a condo, a place that funnily is two blocks from where I’m living now. In case you don’t know about co-ops, it’s not unlike a living situation with housemates, except that we share food, cook meals together and organize events together. So far we’ve had several music soirees, storytelling nights (the Froth), many potlucks and most recently the co-op caroling crawl. I’m planning a film night just as soon as my new HD projector arrives! I had planned on including my goals and aspirations for 2013, but this post has already gotten too long, and there are only a few hours of 2012 remaining. It’s time to go out and celebrate! I welcome you to comment below to share your thoughts. And please subscribe to the RSS feed or if you prefer email updates to be notified when new posts are published. And if you have any suggestions for blog posts you’d like to see, I’m all ears! Best wishes for a wonderful and prosperous 2013!